Looking just for the info on Jane’s Walks? It’s here. Do you ever forget you’re walking because it is such a beautiful walk? Seriously, there are days that you walk with awareness and then others that are more cerebral. Walking is not unpleasant and often really fun. Walking isn’t something that a lot of people think about. We do it all day and often are not aware of it. Mary Wilson has been advocating for “walking” as long as I can remember knowing her. Walking is the tonic to better health as we inevitably age; getting out there on a spring day, cherry blossom smells wafting around or a rainy day walk in the forest. Variety, company, health, transport, what more can be said about walking? Walking as a hobby is perplexing to Wilson. “I don’t really look at walking that way,” she says. For some of us who aren’t in a rush to get here and drive there, or have time in their non-working hours to enjoy walks, this time is cherished time. Being able to engage with family and friends, do meetings walking, and just get healthy wandering the city slowly. A good walk feels great. It can melt the day’s stresses and help one think more clearly. “Walking is slow tech!” says Wilson. Crosswalk goes across 6th but there is no where to cross Stewardson. 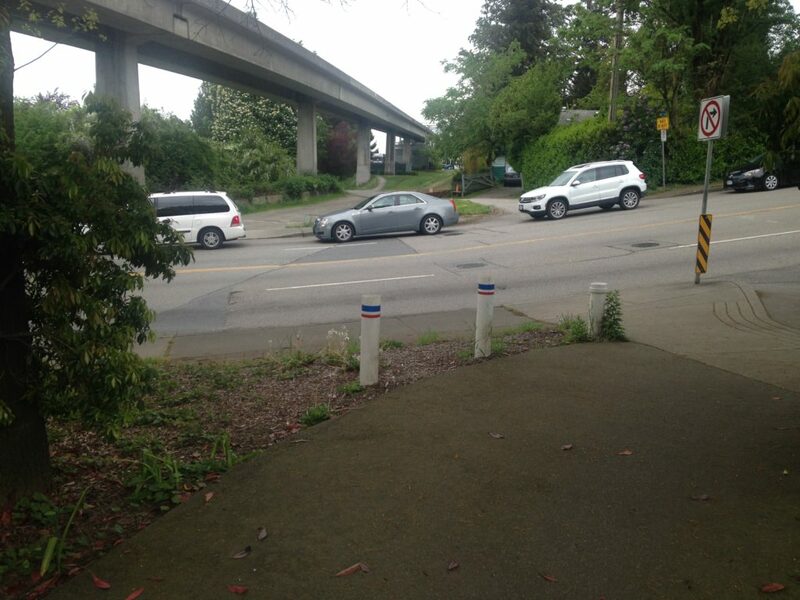 Wilson started advocating for walking in New Westminster when the crosswalk on Stewardson Way near Grimston Park was removed. 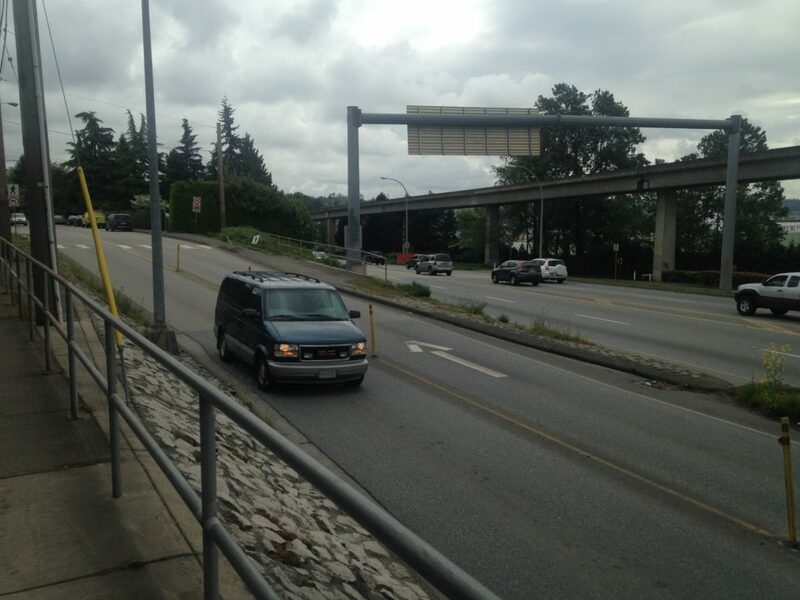 It was this singular incident that made her take action several year ago and contribute time and energy into to the New Westminster City Pedestrian Advisory Committee. 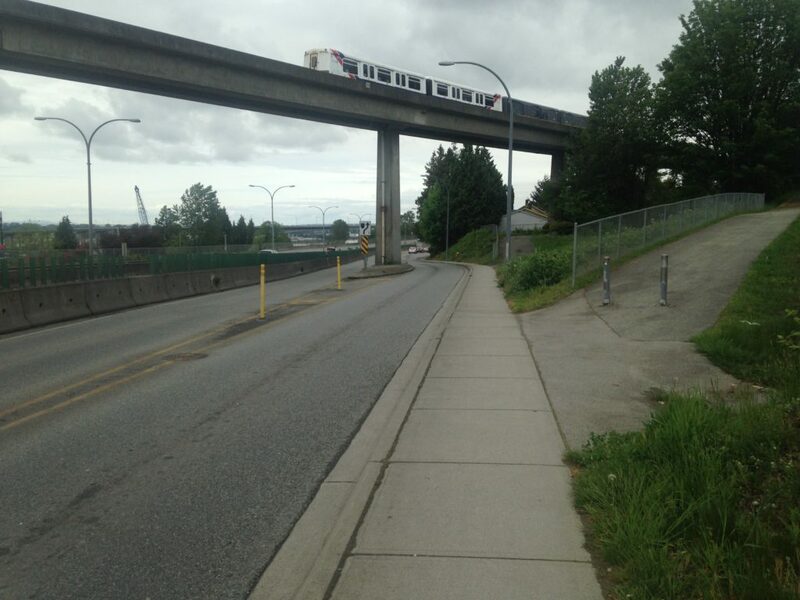 The ghost crosswalk at 20th Street and the Skytrain rail. The old crosswalk is just barely visible under the newer paving. The walking path ends here. Mary is trying to speed up the process. Mary says many pedestrians don’t see themselves as having a voice, at intersections, on the roadside and in many ways in planning decisions. “The general assumption is that people have, will have or want to have a car,” she says. “As a striking example, a recent new resident guidebook didn’t have the word ‘walk’ in it at all while there was written advice on how to get a BC Driver’s license”. Two legs good, four wheels bad? Not that some car use is wrong – there are certain things you simply must use a vehicle for – but Mary sees our City as one that can better itself with a design and function focus that allows for a modal shift to walking. 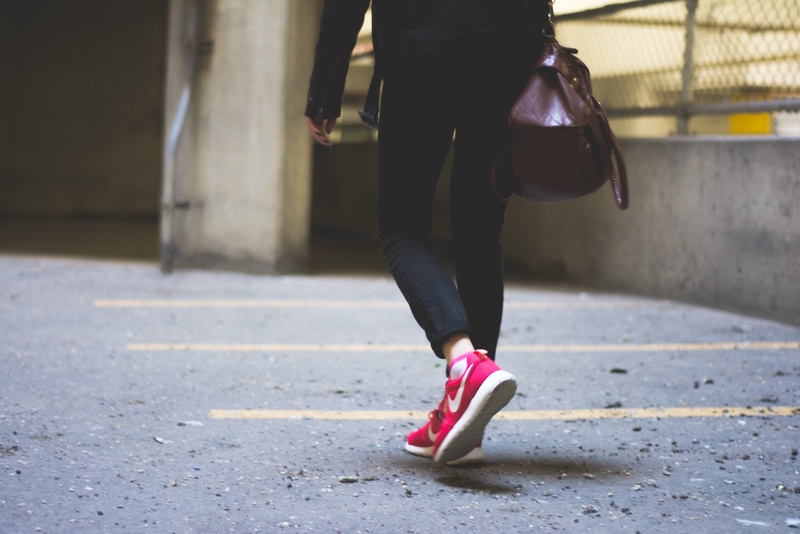 With our aging, obese, and diabetes-challenged society, walking is something Wilson thinks should be given a larger focus in planning at the municipal level. Over the years of being on the ACTBiped Committee, Wilson has collected a file over an inch high of complaints ranging from trips and falls from roots heaving the sidewalk to bad car-centric lighting that leaves some sidewalks pitch black in some areas. For older residents this is a challenge. In addressing the planning aspects of making a City to be more walkable, Johnstone invoked the wisdom of Gil Penalosa, founder and Chair of the Board of Directors of 8-80 Cities whose website says the organization “…promotes walking and bicycling as activities and urban parks, trails, and other public spaces as great places for all”. As well, children are an important planning component with walking Wilson said and for younger kids there is the SafeWalks to School program as well as several School Maps for Active & Safer Walking Routes. Wilson points out that while the City is doing a great job in planning, she believes pedestrians need to have a higher priority from a planning perspective.“Why can’t pedestrians be considered with a higher priority in the city planning process?” she asks. There are many places to have good walks in our City such as parks, many streets, the quay, ravines, shorelines. But while you can get pocket-sized maps for cycling and road maps for driving, there is no all inclusive walking path map, though there are plaques with maps at the Police Station and near the Tin Soldier. 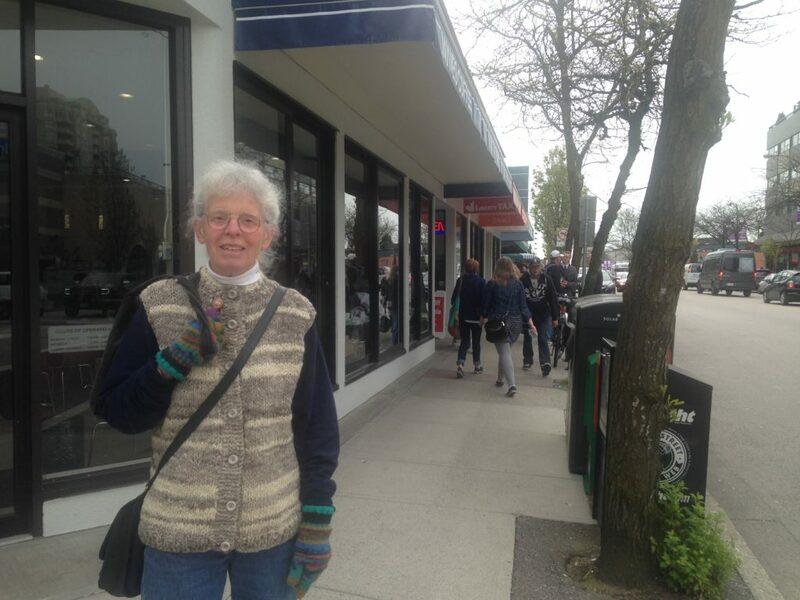 Mary hopes to hear more stories about pedestrian infrastructure and walking events and it’s why she brought Jane’s Walks to New Westminster. “We hadn’t had any [pedestrian] events until I decided to start a New Westminster Jane’s Walk,” she says. Matt Matic, Fitness Programmer at the Queensborough Community Centre and City Organizer of the New West 2016 Jane’s Walk program, believes in the benefits of walking. Johnstone summarized our important link to walking in making a good city: “People walking on our streets means people are on our streets, interacting, meeting each other, shopping, sharing, and integrating, ” he says. Walking is something Mary Wilson wants to see many people re-engage with and frankly get out of the car and experience life as a pedestrian. Walking is something we can all do more of and enjoy the relaxation of slowing down to savour our outdoor experiences. Wilson’s favourite walks tend to link transit and walking. Photo Contributed by Matt Matic. Mary Wilson is my hero! As a new member of ACTBiPed, I was pleased that one of the first presentations was by Mary. I found myself nodding so many times at the points she made. After her presentation, I raised further points that her talk had made me think of. I look forward to doing my part, however, small, to make New West truly walkable. I’ve updated Peter’s post to reflect that!